It’s far too often I find myself going to Reddit, Kotaku, and BoingBoing for all of the news I’ll consume throughout the day. While far from being bad websites, they make finding interesting facts and factual information a little too easy. They pool articles that appeal to my interests and they’re fed to me in an easy-to-read format through either quick 250-word stories or, in some cases, just a headline. But when was the last time you stepped away from the Internet watering hole to find something new? Here’s five websites I frequent to get a taste of something else when my brain has had enough of search-engine optimization. Survival horror is one of my favourite video game genres. The games test your item conservation skills, your puzzle solving abilities, and how much bad writing you can stomach. The website I always go to in order to get some insight into the genre is Chris’ Survival Horror Quest. Chris’ quest was to play and review every single survival horror game ever made. Chris, who works as a video game programmer in California, has also spent a little bit of a time in Japan and had created quite a database of games including Japan-only releases. I really enjoy how in depth he gets in his game reviews and features on game design. As someone who is in the industry, Chris brings an expert’s insight into his blogs. He also manages to expand his coverage past talking about the game itself bringing in horror movies and pop culture into his stuff, but always manages to bring it back to the subject that brought us to his website in the first place. The only problem is Chris doesn’t update his website too often (I chalk it up to life getting in the way since he started the website 12 years ago). As an ex-Cracked reader (I still watch their videos all of the time), I only ever check back for one contributor. Jonathan Wojcik is a blogger who writes about all things creepy, crawly, and slimy. He also has an appreciation for bugs that takes that skin-crawling feeling you may have and replaces it with a not-so-slight amount of admiration for the insect. Jonathan’s creature features and monster reviews are also favourites of mine. His monster reviews usually have him taking an in-depth look at video game monsters and analyzing what real-world counterpart influenced their design. He also collects an array of video game sprites and game art for each article. He’s also created his own world of disgusting, slimy creatures called Mortasheen. I love the ingenuity of the monster designs and there’s a huge community commenting on each giving their impressions of each unique beast. I can just imagine him sleeping soundly only to be woken up by a nightmare and then spending the next three hours cranking out a new design. Matt! Why aren’t you making videos anymore? Anyway, Matt from Dinosaur Dracula! is as old as the Internet itself with his previous website X-Entertainment dating back all the way to 2002. 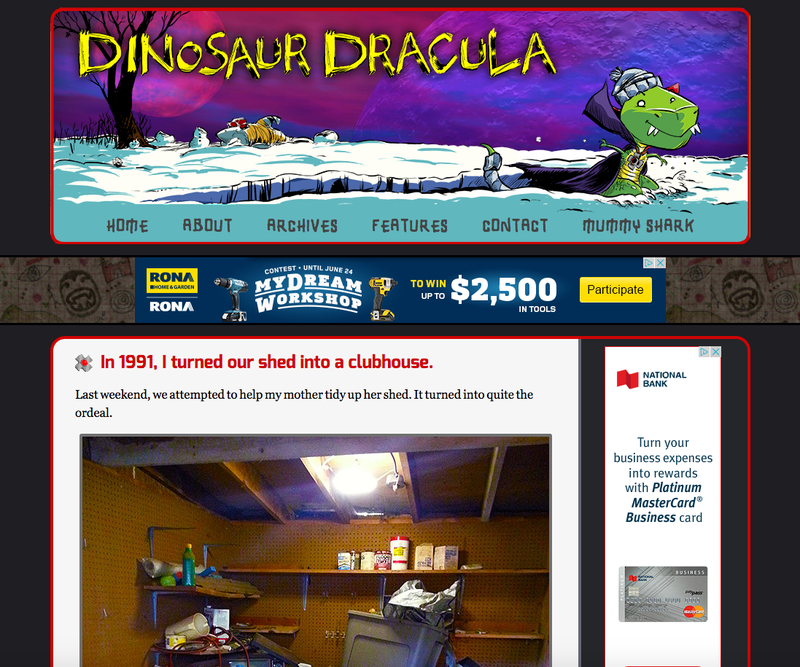 His new website Dinosaur Dracula! covers much of the same content with actions figures, garage sales, and Kool-Aid reviews making up a huge part of his articles. Matt also creates YouTube videos once in a while where he reviewed toys and put on a ludicrous amount of makeup for his annual Halloween Countdown where his alter ego would takes over. Sometimes it’s hard to tell if his enthusiasm for the small nods some companies make to the spooky holiday season is genuine or a little tongue-in-cheek. Regardless, it’s always funny. And another funny thing is that Matt is the originator of the “Crate” phenomena that’s sweeping across the Internet today. Since 2002, he’s been sending out packs filled with toys and snacks to subscribers. He’s still doing it to this day for about $25. I can only imagine that the service is done out of necessity for all of the toys and nostalgic stuff he buys when he does his flea market raids. Those are three websites I frequent when I’m looking to find something outside of the normal Internet chatter. They all manage to scratch an occasional itch in the depths of my brain that likes to think about video games, action figures, and slimy bugs once in a while. I think it’s important not to forget that the Internet is full of interesting people creating interesting content. Aggregators bring us what other people think is important and blogs that gather information can sometimes be too catered to their readership. Chris, Jonathan, and Matt bring readers a variety of content while keeping up with their readers through comments. 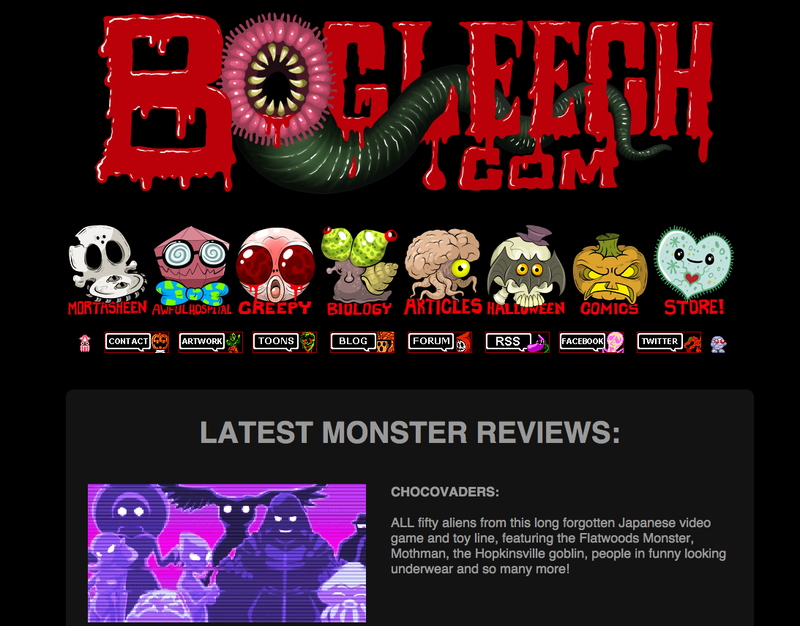 This entry was posted in Internet and tagged blogs, Bogleech, Chris Survival Horror Quest, Dinosaur Dracula!, websites. Bookmark the permalink.